Treeman Knives by Jim Behring offers a selection of fine knives at fixed prices from dealers with a verifiable history of integrity. Jim "Treeman" Behring creates distinctive old school, hand-crafted knives that serve a variety of purposes from the very best materials . Knives that fit well in the hand, each one uniquely designed and different from the last. Knives that will suit their owners, serve them well and last a lifetime. 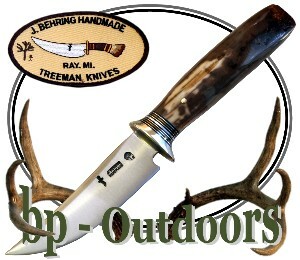 BEHRING MADE strives to make the best knives on the market. James and his team of craftsmen are constantly creating and perfecting new projects with innovation, quality craftsmanship, and functionality being the cornerstone of the creative process. Scagel style and tactical knives made by guys who do not need to be part of a club to sell knives, or follow a set of rules. They believe in using only the highest quality materials. The kind of knives that work as well as they look and feel. The kind of knives people will write books about and tell stories to their kids about. Treeman Knives are made in USA! (Michigan). 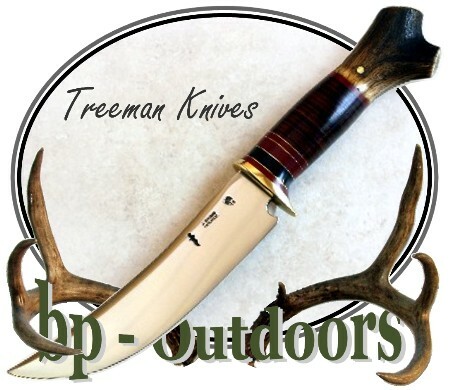 The "Treeman" name was earned in the timber clearing business and continues as part of the trademark of their work creating Scagel style, outdoorsman and combat style knives. Their hammer forged blade materials include studebaker spring steel and quality high carbon tool steels. 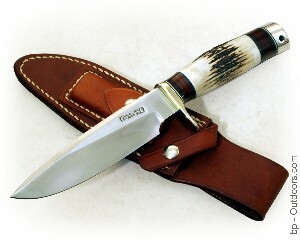 handle materials include stag antler, Micarta and mamoth ivory.